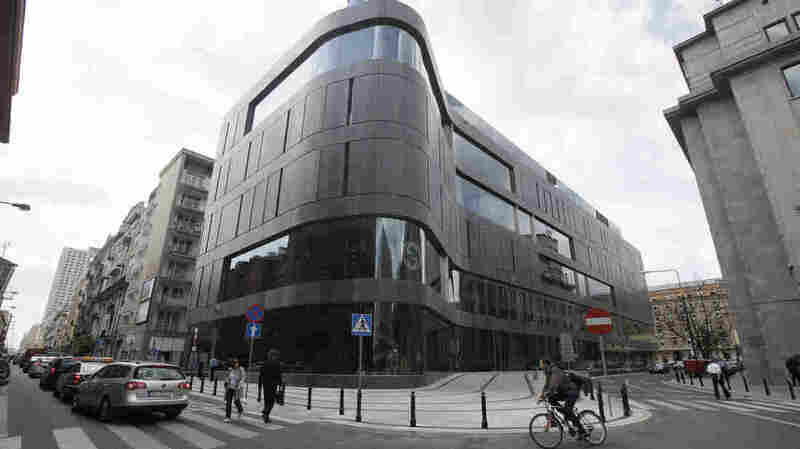 Poland Watches Warily As Euro Crisis Spreads Poland is part of the EU but hasn't yet adopted the euro single currency. An economic success story during rough times, Poland's economy grew an average of nearly 4 percent annually since 2008. But now there is concern that the crisis in the eurozone may threaten the country's post-communist run of prosperity. One of the latest additions to Poland's growing luxury goods market, the Wolf Bracka department store, beckons shoppers in the heart of the Polish capital, Warsaw. The country's economy continues to grow, but Poles are anxiously watching the crisis in the eurozone. One factor that has kept Poland somewhat insulated from the eurozone crisis is domestic consumer spending. Poland had more than 4 percent growth last year while the rest of the continent was mired in negative or flat growth. Poles have more discretionary income than ever before, and they're using it to buy things in swank malls cropping up all over the country. "Consumer spending has risen significantly in recent years," says Miroslaw Borjarczyk, as he shops at Warsaw's Golden Terraces mall. "I think it's because of malls like this, which allow people to buy a wider variety of products in nice surroundings, and this spending is a driving force behind our economy." Just over 20 years since the end of communism, rampant consumerism is now embraced as Poles feel like they are still trying to catch up with Western Europe. But with the debt struggles of Greece, Spain and others, many Poles see danger signs ahead. Pawel Jozwicki, who works installing industrial air conditioners, is not hesitating to buy a new washing machine as he shops at a chain store in central Warsaw. But he is having second thoughts about his country's plans to eventually join the euro single currency. "I really think it's best to stay with our own currency like Great Britain did," he says. "They stayed with their own money, and today they're able to take care of themselves a lot better." The anxiety is well-founded. Poland's economic destiny is deeply tied to Europe: About 80 percent of its trade is with EU countries, about 30 percent with neighboring Germany, Europe's largest economy. "If you are a Polish investor sitting on cash, you [are] looking ... [at the] disaster which is happening in eurozone, you are simply afraid of investing big money," says Ryszard Petru, a partner with PwC in Warsaw. If you are a Polish investor sitting on cash, you [are] looking ... [at the] disaster which is happening in eurozone, you are simply afraid of investing big money. He says many Polish companies are now investing enough to keep operations going, but they are holding off on making big-ticket investments in infrastructure, expansion or hiring. "You are going to think twice or three times before you do it," he says, "because if euro breaks up, nobody knows what's going to happen. So in other words, what we see: hesitation. People are very cautious. And they are postponing big stuff." That can have a ripple effect. Poland's economy is diversified, but not so diverse that it could absorb a eurozone shock. Polish Finance Minister Jacek Rostowski recently warned of "potentially serious risks" to the economy from the debt saga. "The nature of the threat is we don't know exactly how severe it will be," he said. "I warn that it would be very serious." Adding to the economic apprehension here is the forthcoming big drop in public spending. Poland has been the biggest benefactor of EU structural funds for highways and other large infrastructure projects. Poland pumped money into gigantic ventures, including roadways and stadiums, ahead of co-hosting the Euro 2012 soccer tournament in June. In all, it is estimated that Poland's total preparations for Euro 2012 amounted to more than 5 percent of its gross domestic product. That massive, de facto stimulus program is now over. Still, banker Joseph Wancer, chairman of the American Chamber of Commerce in Poland, says this is no time to panic. "The fact that its GDP is not 4 percent, but it's 2.8, should not be interpreted that it's a catastrophe," he said. "It's still excellent and much better than in most other countries. "It's a slowdown. We are dependent on what's happening in our region, in Europe, what's happening globally." He argues that Polish banks are fundamentally solid, and he should know: In many ways, he's the father of modern Polish banking. Wancer's Jewish parents were arrested by the Red Army after fleeing the Nazis eastward during World War II. He was born in a Soviet labor camp in 1942. After the war, he and family members made it to the U.S. He returned to Poland from a banking career in America just after the fall of communism and played a central role in helping Poland build a modern banking system. He notes that few Polish banks today dabble in exotic derivatives or are badly exposed to Spain's disastrous real estate holdings. "It's completely wrong to have banks that cannot fail because they are too big," he says. "Although I am a banker for 50 years, I have to say this is completely wrong. It grew to the point where banking services and products are being produced that very few people really understand, and there is nothing tangible behind these products." Wancer thinks Poland can withstand some shock if the euro crisis deepens and spreads, but he quickly adds a caveat: "Nobody knows to what point we can hold out. There is no country that is that strong enough to resist a tremendous attack if it comes from all sides, or if the eurozone breaks apart."